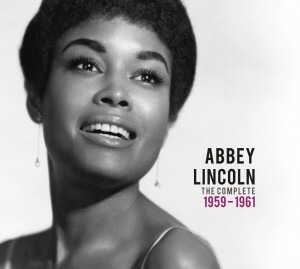 The axiom that behind every great man lurks a great woman was inverted in Abbey Lincoln’s case. She could easily have been just another of the myriad 1950s singers with a pretty voice had she not fallen in with Max Roach. Roach – master-drummer, composer and band-leader – had no time for glitzy surfaces and hollow music. Lincoln saw the light and devoted the rest of her long career – she died in 2010 – to pursuing truth and beauty in her art. This two-CD compilation charts that most interesting phase in any artist’s career: a turning point. You can hear Lincoln almost sounding like a ’50s pop singer (with appropriate reverb!) on a song like Thursday’s Child. But then from the very same session (her band including pianist Wynton Kelly) she sings Brother, Where Are You? with affecting intensity, even though her distinctive voice remains as light as a blast of cool air. The real action begins after her affair with Roach evolves into working together. Lincoln’s singing bristles with commitment, and their collaboration culminates in a masterpiece. Both were devoted to the civil rights movement, with Roach the first African American musician to make an explicitly political recording. Never one to pull punches, he called it We Insist! Freedom Now Suite, and Lincoln sings like it was her last chance to make a difference.